Later this evening, a feature will go live at The A.V. Club that focuses on some of the changes between A Song of Ice and Fire and Game of Thrones. [Edit: You can find said piece here.] When completing my own contributions to this feature, my interest was less in discussing whether or not the changes involved were good or bad, but rather to consider how the logistics of making a television series necessitated certain changes that had a clear effect on how this story is being told. It’s fitting that it’s emerging on a night when there’s plenty more to add to the list. “Oathkeeper” is written by Bryan Cogman, who of the show’s writers had the most to live up to when it comes to the text of the original novels. Now a co-producer on the series, Cogman has been the person in the writers’ room with the closest relationships to the books and their lore, and has been the most active of the show’s writers in engaging with the series’ rabid fanbase. Although he never outright swore an oath to fans of the books regarding keeping their spirit intact, he’s been the most directly tied to fan communities, drawing both praise and anger in equal measure as the two narratives play out. I say “two narratives” because I think it’s necessary at this stage in the game. Ultimately, I feel safe in saying that A Song of Ice and Fire and Game of Thrones are telling the same story, but they’re following two different narrative paths to get there, as evidenced by an episode that does a lot of labor in the interest of condensing a sprawling narrative into something more manageable for a television series. The result at times feels like pieces on a chessboard being awkwardly pushed together in ways that break the rules, but they’re rules only some of the show’s audience will even know exist, and rules that—unlike oaths—are made to be broken in the interest of a new set of rules that have developed over the course of this new narrative. Last season, Game of Thrones ended its penultimate episode with a shocking moment. With the swing of a sword, Eddard Stark was dead, and the ecosystem of the series had changed forever. The finale, “Fire and Blood” was largely left to pick up the narrative pieces that were left behind, selling viewers on a show without its lead. As a result, last season’s finale became about journeys forward: Tyrion’s journey as the King’s Hand, Robb’s journey as King in the North, Dany’s journey as the Mother of Dragons, Arya’s journey back north with Yoren, Bran’s journey as the Lord of Winterfell, and Jon Snow’s journey beyond the Wall with the Night’s Watch. By comparison, “Valar Morghulis” has a greater burden to resolve ongoing storylines, with more of the season’s climax left to be explored given the contained explosiveness of last week’s “Blackwater.” While any simplistic analysis of the season’s narrative would identify the battle in Blackwater Bay as the season’s climax, the disjointed nature of the various journeys means that each character has been headed towards their own climaxes which were promptly delayed by last week’s events. Dany is still looking for her dragons, Jon is still a captive of the Wildlings, Arya is on the run from Harrenhal, and Bran remains hidden in his own home as Theon reigns over Winterfell. And these are only the storylines that we could identify most cleanly, as we could also consider Jaime and Brienne’s journey, or Robb’s relationship with Talisa, or any number of other threads that “Valar Morghulis” is expected to contend with. For the most part, however, “Valar Morghulis” follows the example of last year’s finale, largely focusing on pivoting towards future storylines. This is not to say that it is anti-climactic, with Dany’s storyline in particular reaching a strong conclusion and the final moments of the episode delivering the equivalent thrill to last season’s reveal of Dany walking out of the fire with her dragons around her. Indeed, both episodes also spent a lot of time with characters taking stock of what has happened, settling on a course for the future, and then largely disappearing as other storylines took over. The difference, though, is that there is something more substantial to take stock of. These characters are all older, mostly wiser, and each more clearly placed on a particular path. If last season’s finale was designed to solidify that these characters are not simply meant to live normal lives, consigned to a life at the heart of this conflict whether or not they choose that life, “Valar Morghulis” was about how that experience has changed them, and how the beginnings of their journey will prepare them for what’s to come. It may be the same structure, in other words, but the result is a stronger finale, and a good burst of momentum into a third season. This central idea has been at the heart of Game of Thrones from the very beginning: the children we’ve come to know, and the younger characters who jostle for power, do not know the true struggles of both the actual winter (starvation, struggle) and the metaphorical winter (war, bloodshed) that await them in the future. Unfortunately, almost all of these characters have been faced with this reality sooner than they anticipated, pushing characters like Sansa and Arya Stark, Theon Greyjoy, and Renly Baratheon into positions where they must reconcile their fears and insecurities with a path they might not have chosen if not for the circumstances. Their struggles, however, must remain largely personal: while Theon Greyjoy might struggle to decide between his two families, for example, he has no one on the Iron Islands to talk to but a single flame and a piece of parchment. When he chooses to burn what he’s written, he makes his decision by isolating himself and accepting that this is his burden to bear as his father’s son. “What Is Dead May Never Die” is about exploring these kinds of relationships, and exploring really is the right word: although partnerships both begin and end in the episode, other scenes are more about the complicated politics of those partnerships as winter approaches. While the show is still at the point where plot remains on the backburner, the pieces moving into place no longer seem motivated by the whims of the script; characters are taking greater agency in this environment, and the result is a strong thematic piece which lays some important groundwork for characters both new and old. What do people really want to know about HBO’s Game of Thrones as it enters its second season? When the first season premiered, writing a pre-air review was an easy process. Fans wanted to know how well George R.R. Martin’s A Song of Ice and Fire had been adapted for the screen by David Benioff and D.B. Weiss, and non-fans wanted to know if the result still qualified as a television show worth their time. These questions were conveniently interlinked, in that the show’s success as an adaptation (faithful but not slavish, episodic without losing broader narrative complexity) was very much part of its appeal to non-readers. However, I found myself somewhat stumped as I sat down to write about the first four episodes of the second season. The challenge is that we’ve already answered those broader questions, and to my mind the answer hasn’t changed – the show is still a compelling and worthy adaptation of Martin’s series, and that still results in some tremendous television. I have some specific comments about nuances in the adaptation, and some opinions about how certain stories are being depicted, but I don’t feel as though I have anything new to add to the growing chorus of people praising the show upon its return as a preface to my post-air reviews which will go up over the next four weeks (and which will delve into those nuances and opinions in more detail). Looking to solve my writer’s block, I opened up the conversation to my followers on Twitter and the users at NeoGAF (where a lively community has been built around the show), asking them whether they had any lingering questions they had which they didn’t feel had been covered by the mass of reviews to date. While I want to address a few directly, the larger takeaway was that readers and non-readers might have more in common as the show goes forward than I had presumed, a notion I’d like to explore further. It is now widely accepted that the way we watch television is a variable – if you’re reading this, chances are that I don’t have to regale you with the myriad ways we can now watch the programming we’ve historically viewed live in primetime, and so I can keep my big “DVRs, Streaming, and Bears, Oh My!” song and dance in my pocket for the time being. However, I would argue that Game of Thrones represents a specifically complicated television text in this regard. Like all shows, there are questions of how it played on a week-to-week basis compared to how it would play as a marathon, questions that partly inspired the tremendous discourse around television narrative spurred on by Ryan McGee’s essay at The A.V. Club. However, in addition, the variables of consumption around the show are equally divided by the nature of its source material, with perhaps the clearest binary between “reader” and “non-reader” in television history. The result, I would argue, is a complex, diverse audience base who watches the show from different perspectives which make it difficult to generalize regarding what attracts them to a DVD or Blu-ray box set. 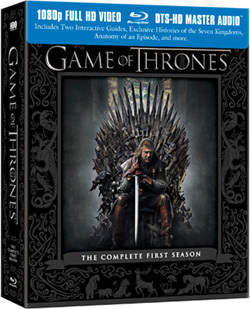 However, with Game of Thrones‘ Complete First Season (which I reviewed on Blu-ray), I really think HBO has succeeded in creating a set that has more than a little something for everyone, worth the price of admission for both readers and non-readers alike (along with those who are watching for the first time, for whom this set is a tremendous introduction). The production values are exceptional, the features are fairly plentiful, and the set fits comfortably into the quality aesthetics that both the show itself and the earlier paratexts achieved last year. And yet, while I can easily recommend this set based on its own merits, there’s still some part of me who was left wanting, if not something more, than perhaps something different. Earlier this week, I rewatched last week’s penultimate episode, “Baelor,” with my brother who was seeing it for the first time. Generally, I’ve been watching Game of Thrones alone, and any interaction with other viewers has been done online (or, if done in person, was done with people who I had previously interacted with online). For the first time, I was sitting in the same room as another viewer as we watched the show, and the experience made clear what I had known from the beginning but had never seen quite so clearly visible: Game of Thrones is a show that every single viewer likely considers differently. It is not just that we can separate between readers and non-readers, although that is certainly the most obvious distinction to be made. Rather, we need to also consider questions of genre, gender, sexual content, race, and other qualities which have been called into question over the course of the season: regardless of whether I individually had concerns with the show’s use of fantasy, or its sexposition, or the Othering of the Dothraki, the fact is that those concerns existed, and have created a divisive response even among those who generally like the show. In a piece earlier this week, friend of the blog Cory Barker wrote about his ambivalence towards the series, and kept trying to find reasons for it within the text. While his process was enlightening, he couldn’t find the silver bullet: there was no one part of the show that was creating a lack of an emotional connection. How we view the series can be defined by issues like genre which are inherent to the text itself, or issues like viewing patterns which are entirely extratextual but can define one’s experience with the text. My brother, for example, watched the season on a staggered schedule of short marathons, while my parents watched it on a weekly basis; as a result, they remembered different things, retaining different parts of the show that were highlighted by their personal experience with the text. I raise all of these points because after a season of open interpretation, at least for those who hadn’t read the books, there is something almost prescriptive about “Fire and Blood.” While “Baelor” delivered a fatal twist, and suggested a certain degree of carnage to come in the weeks ahead, “Fire and Blood” steps back to serve as a more traditional denouement, laying out the various threads which will be followed into a second season. Rightly treating the fate of Ned Stark as the season’s climax, it seeks to explore the scenario that Mirri Maz Duur lays out to Dany early in the episode: what is the worth of each of these characters and these storylines in light of recent events? It’s a moment where the show actually has to step forward and proclaim its identity in order to convince the skeptics that this is a show worth watching, and to convince the believers that their faith has not been misplaced as the show transitions into the next stage of its narrative. “Fire and Blood” doesn’t beat around the bush: it shows its hand from its bloody opening to its fiery conclusion, laying out a pretty detailed framework for what the second season of the show will look like. However, it never feels like an artificial framework, and that sense of interpretation never disappears even as the storyline becomes less open-ended. Serving as a fitting bookend to what I personally feel was a very strong first season, “Fire and Blood” reinforces central themes and delivers on what matters most: reminding us why these characters are following the path they’re on, and informing us why we want to follow that path next season. In the opening moments of “Winter is Coming,” we saw the Wall for the first time. Directly after the credits rolled, we first set eyes on Winterfell. Shortly thereafter, we visit King’s Landing for a brief moment as Cersei and Jaime discuss the secrets that may have died with Jon Arryn. These were the first moments that we, as viewers, saw these pivotal locations in this series, but two of these were never formally introduced: Cersei and Jaime rode north to Winterfell soon after that conversation, and we saw only a brief glimpse of The Wall at the conclusion of “The Kingsroad.” Our focus was on Winterfell, and on the parties who set forth from its walls, and on Dany’s struggles across the narrow sea. In “Lord Snow,” the Wall becomes more than an imposing structure, and King’s Landing becomes more than a geographical entity. The episode opens with Ned riding into King’s Landing and immediately finding himself in a meeting of the Small Council, while we are catapulted into Jon Snow’s first training session with Ser Allister Thorne without any glimpse of his initial arrival. There is no time to rest or become acclimated to their new surroundings, as life in King’s Landing and life at Castle Black hold a new set of challenges which will shape the episodes to follow. And yet, “Lord Snow” is perhaps the most narratively uninteresting episode of the first six, almost like a second pilot where no story truly finds its footing. While the political organization of King’s Landing is sketched out, and the reality of being a brother of the Night’s Watch is well-established, the actual payoff for these events are left for the subsequent installments. Returning to this episode after having seen that which follows, I found myself appreciating what it accomplished without necessarily finding it satisfying, the first episode where the narrative feels limiting rather limited.